Part of Australia comprising the settled portions of New South Wales and South Australia. This is a fine example of the 1851 Black Map of South Australia, New South Wales and Victoria, Australia. It covers the settled areas of New South Wales and South Australia. 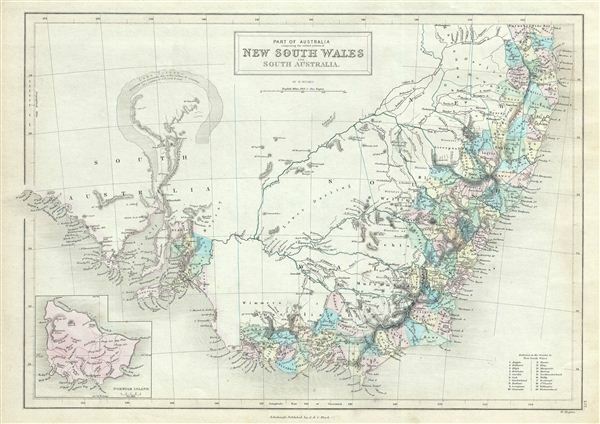 Victoria, which became an independent colony separate from New South Wales only in July 1851, the year this map was published, is here depicted as part of New South Wales. The interior is relatively unknown though, at this point in history, the coastlines are accurately mapped. Parts of modern day Victoria are identified as 'Australia Felix' (the early name given to the lush green pastures of western Victoria). An inset map in the lower left quadrant details the Norfolk Island, while the lower right quadrant lists the counties in New South Wales. Various cities, towns, rivers, mountains, bays and several other topographical details are noted with relief shown by hachures. This map was engraved by William Hughes and issued as plate no. LVI in the 1851 edition of Black's General Atlas of the World.